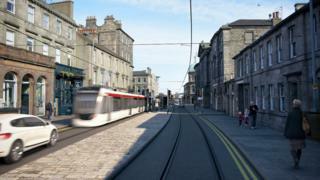 A proposed extension of Edinburgh's tram line would cut one of Edinburgh's busiest streets down to one lane for 18 months. The closure of three lanes on Leith Walk would begin when construction on the £165.2m project, if approved, gets under way in 2019. A business case details extending the line by 2.8 miles (4.6km) from York Place to Newhaven. A compensation and support scheme would be set up for businesses on the route. Businesses have expressed concerns about the impact of the project. The plan is for services to be running on the line by spring 2022. It also shows the extension would have segregated cycle lanes. Edinburgh medical student Zhi Min Soh, 23, was killed in May in a collision with a minibus after her wheel became caught in tram tracks on Princes Street. The business case estimates the extended tram line will have a positive economic impact on the city, with every £1 spent providing a return of £1.64. The council approved in principle the option of completing the existing tram line to Newhaven in December 2015. The report will now be considered at a meeting of the local authority's transport and environment committee on 4 September before going to full council on 21 September. It seeks authority to begin identifying a potential contractor for the project, with a final decision on whether to go ahead to follow in autumn 2018. Adam McVey, City of Edinburgh Council's leader, said: "Edinburgh is growing faster than any other city in Scotland and our current road network and public transport provision simply aren't sustainable given the number of new residents we're expecting to welcome here over the next two decades. "Rather than exacerbating traffic problems on our already-congested roads, trams allow far greater numbers of people to travel while creating employment during construction, boosting development along the route and connecting people to centres of employment, leisure and retail." The consideration of the business case will coincide with public hearings in the inquiry into the original Edinburgh trams scheme. The probe, set up in 2014 by the then first minister Alex Salmond and led by Lord Hardie, is examining why the project went significantly over budget and was delivered years later than originally planned. The new business case suggests that a process is put in place to ensure all recommendations from the inquiry are taken into account before contracts for the new construction works are signed. Transport convener, councillor Lesley Macinnes, said: "Given the experience of the last tram project, we're acutely aware of the need to scrutinise this business case as rigorously as we possibly can - residents deserve nothing less. "We won't take any decision on completing the line to Newhaven until we are 100% confident that the project can be delivered, financed and managed effectively."